I have been an artist for as long as I can remember. I work in clay, acrylic, watercolor, printing, fabric and anything else that strikes my fancy. My trademark are my bright colors and whimsical designs. I am part of 67th Street Printmakers and am the art director for Jacqui's cafe on Michigan Rd. I have taught art to children for over 35 years and have written and illustrated 3 children's books. I am presently working on 2 others. I treated the barrel like it was one of my clay vessels. These flowers and designs are kind of my trademark. This is my second year painting a barrel. I really like the process and I like to help the City of Carmel. I'm an IU graduate and later attended classes at IUPUI, John Herron School of art from 1996 to 2001. I taught silk painting classes at the Indianapolis Art Center in Broad Ripple for ten years and continue to teach art classes at my studio in Westfield, IN and sometimes teach silk painting classes at the Inspire Studio Gallery in Carmel. I am also honored to be an Indiana Artisan and have participated in the Indiana Artisan Marketplace since 2014. I knew I wanted to use bright colors and create a floral pattern. My former intern and artist friend, Samantha Leigh Wright, assisted me with the painting. In a joint collaboration, we painted the barrel while listening to 70's rock and let the barrel and paint guide us through the process. My favorite part was watching the pattern emerge on the barrel though mine and Samatha's painting styles. I try to notice the beauty in nature. I enjoy using many different mediums and sharing my efforts with others. 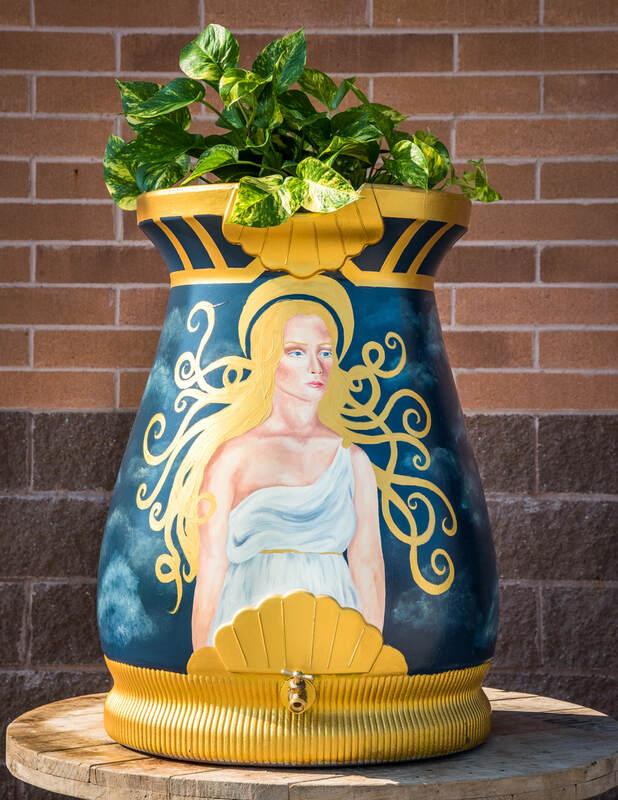 It is great that the city of Carmel promotes art on many levels. Cardinals are the Indiana state bird. 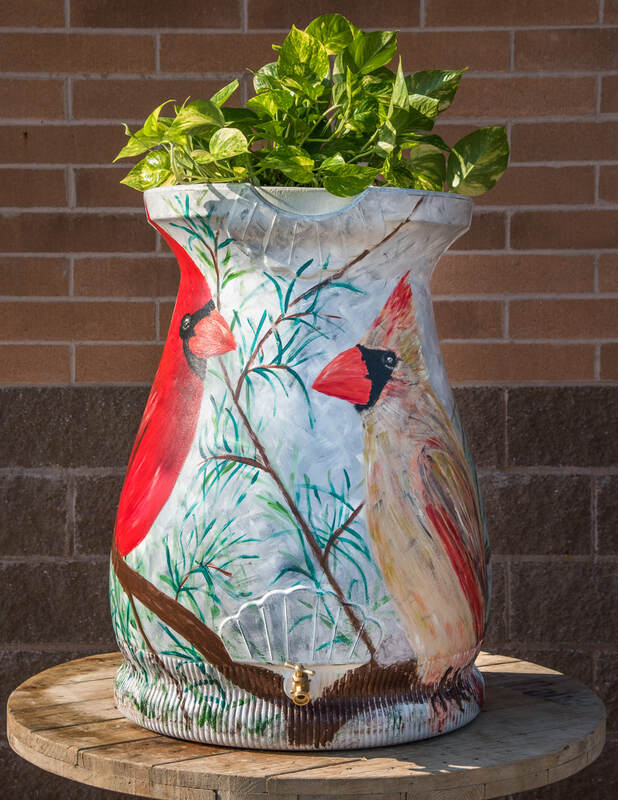 Painting the Cardinals all around the barrel. Our Carmel painting studio employees (10) local Artists that provide step-by-step instruction to complete an acrylic painting in just a couple hours! We feature public classes for adults and kids age 7 and older. We also host private parties for Birthday's, Anniversary's and Team Building events. We inspire people through ART to have more FUN and create lasting MEMORIES. It is so important that we take care of bees and their environment. The bees, the flowers, human beings and everything that developed alongside humans are all an interconnected series of events over an enormous amount of time. 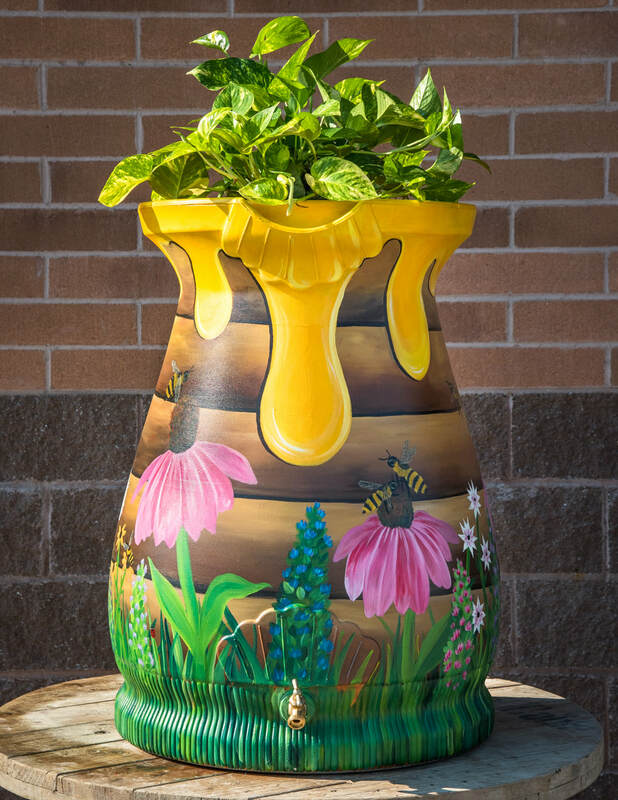 We wanted to show the beauty that bees bring to our lives. Doing it as a team and watching our design come to life! I'm a disabled artist and writer, living in Noblesville, IN. I have an MA in Anthropology and left a PhD program for Applied Linguistics after developing cardiac problems. Fairly recently, I became a self-taught artist; I started creating and selling artwork about five years ago. I use a lot of texture in my artwork because of my vision-related disabilities. My art and writing has earned national and international recognition, and I received a FY2017 Indiana Arts Commission Individual Artist Project Grant to create a series of 14 large-scale paintings that illustrate various elements of life with hidden disabilities. I'm juried into the Hamilton County Artists' Association in both 2D and photography categories, and I'm an artist member of Nickel Plate Arts. I am a co-founder of Logan Street Sanctuary, Inc., which is an all-volunteer 501c3 nonprofit cultural arts organization in Noblesville. 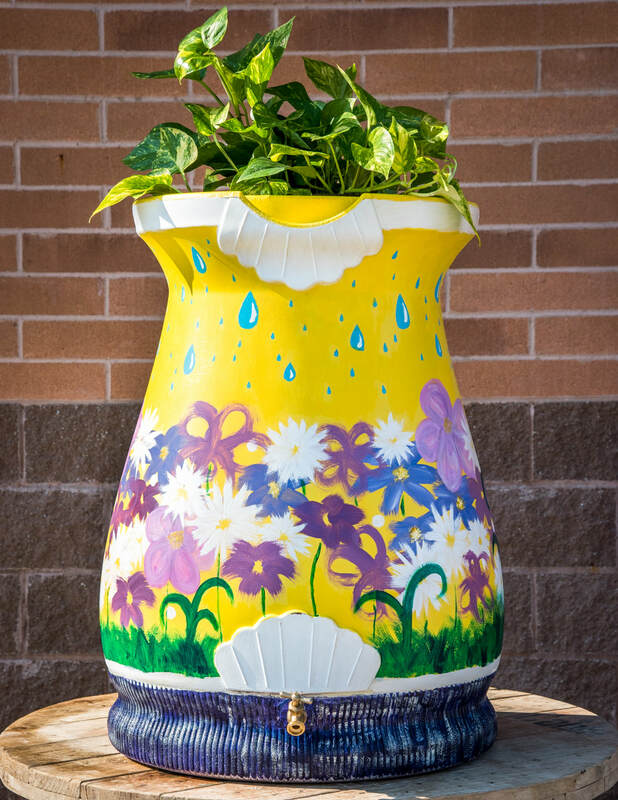 The inspiration for "Summer Rose Garden" was really simple: the "Rain on Main" rain barrel auction event raises awareness for water quality and conservation; storm waters collected in rain barrels provide water for gardens and flowers, and my favorite flowers are roses. 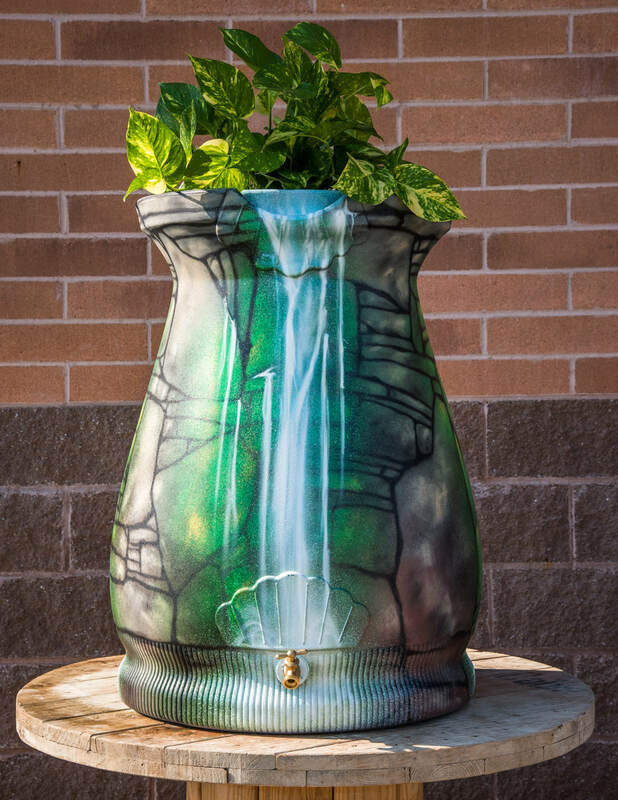 In my design, I included elements representing Indiana's blue summer skies above the "garden" and storm waters collecting below, "feeding" the roots of the "garden". 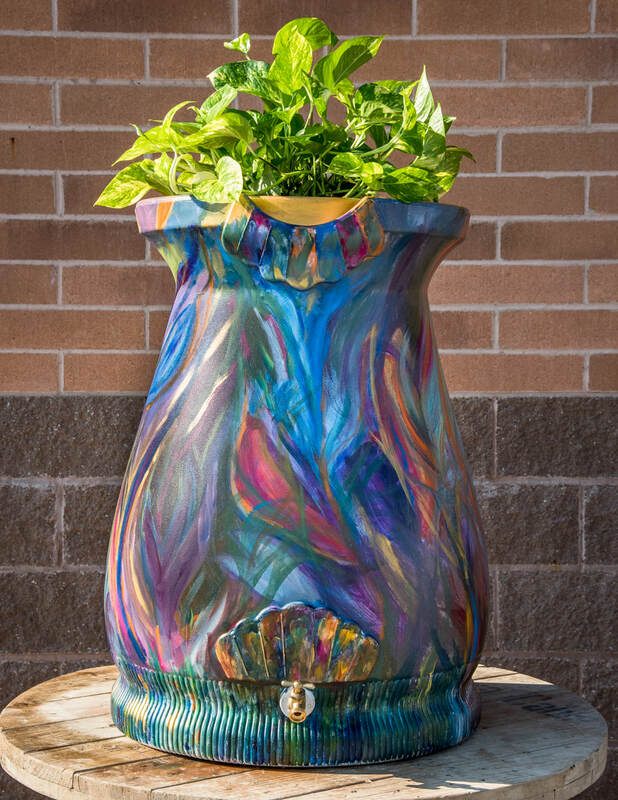 My 2D work is usually textured semi-abstract impressionism, and I am really happy with how this 3D rain barrel turned out. 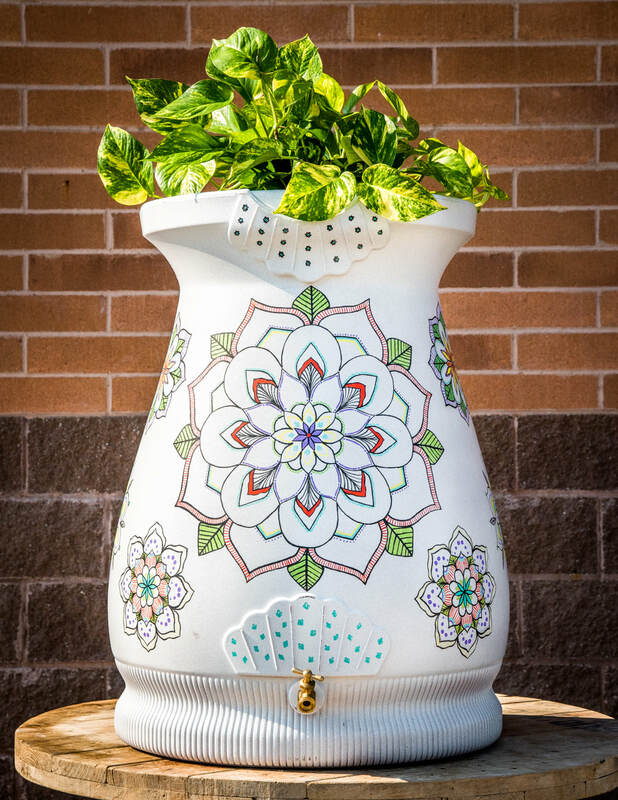 I've painted rain barrels before, but this one is the first time I've included texture in my design. fun. Scary because the barrel is a bit awkward to handle whilst painting, and I didn't know if my vision for the barrel's design would actually turn out even close to the way I wanted. Nevertheless, my awkward painting process brought my vision of a "Summer Rose Garden" to life, so it was great fun! I'm an incoming freshman at Purdue University and participated in the rain on main last year also. Art has always been a passion of mine even though I don't plan on pursuing it as a career. 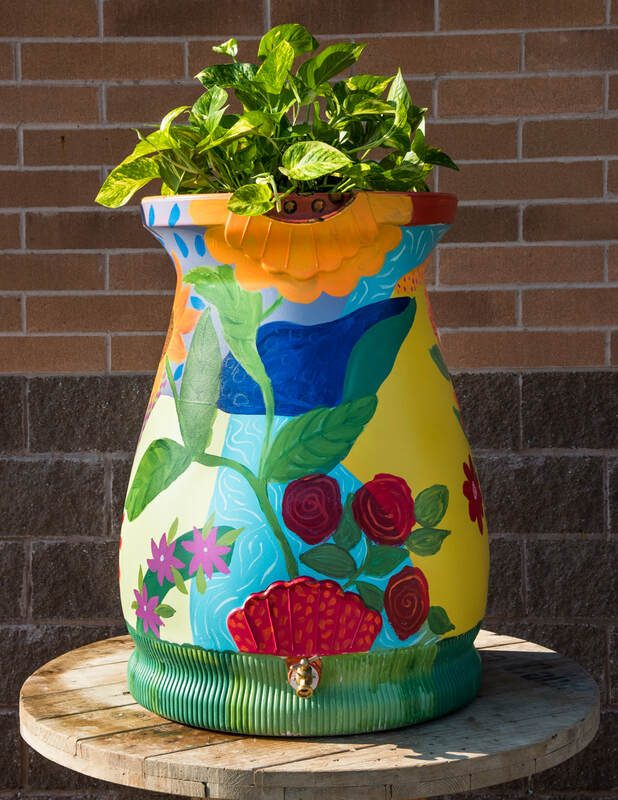 My inspiration for this barrel is from all of the flowers and plants that bloom in fields and grow freely. My favorite part was experimenting with different ways to create the flowers themselves. Simply put, I have always loved art! From drawing to sculpting to visual media, I enjoy the creative process. Above all, I never take myself too seriously. I have always stood by the philosophy (and tell my kids) that there is no "right or wrong in art" - it's a way of expressing yourself and there are many ways of doing so. My inspiration for my barrel art was drawn from the fusion of children in the present and the future. 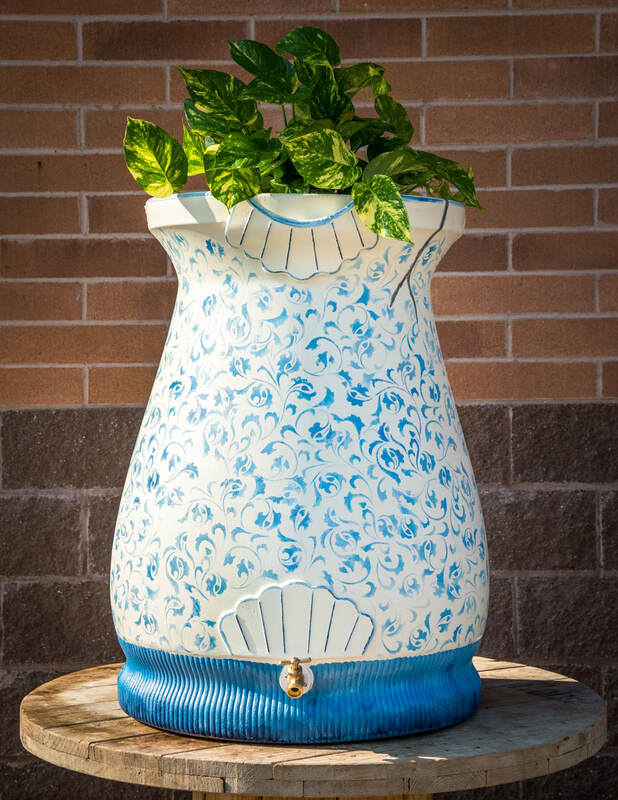 The water-barrel in its purest form represents conservation at a time when drought and climate change take center stage. 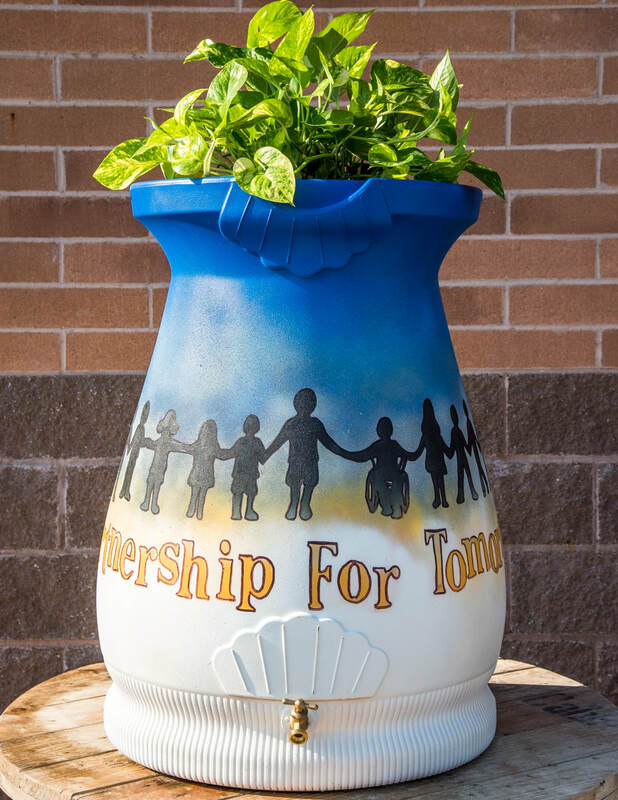 The silhouette of children tie the teamwork on the barrel to collect rainwater for this cause. And its largely drawn in Carmel colors to bring this home to our community. My favorite part was the "work" - thoroughly enjoyed the process of thinking and creating this piece. I have loved and created art ever since I could hold a crayon! I graduated from the American Academy of Art in Chicago with dual degrees in graphics and fine art. I have been fortunate to spend my entire career as an artist in various forms... in graphic art for many years, teaching elementary school art, and creating my own artwork. 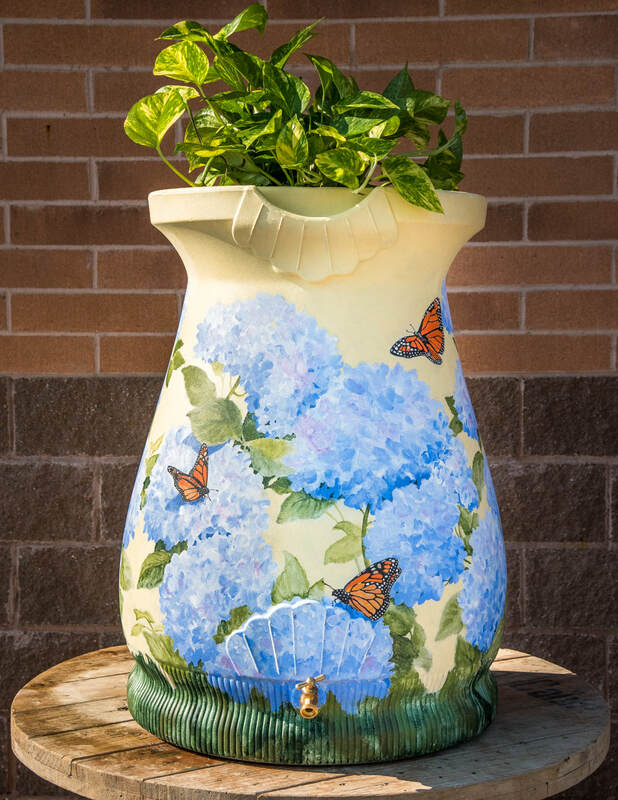 Being an avid gardener, I thought about what I would use the collected water for... and I came up with one of my favorite flowers, hydrangeas. Of course, I needed to include some of my garden visitors too... monarch butterflies! 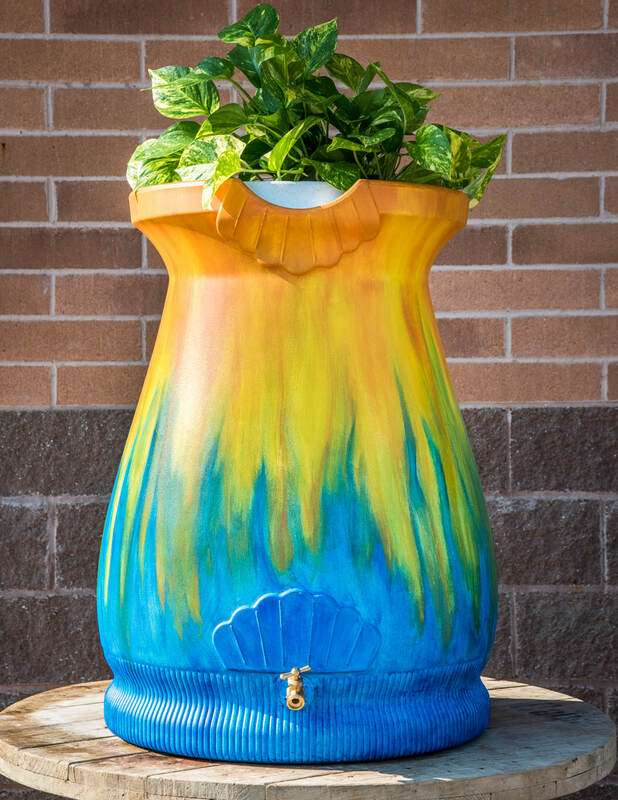 I always enjoy painting on unusual items, and have done lots of furniture, accessories, and wall murals... but this is my first rain barrel. Not only was it fun to paint, but it is a great way to encourage people to save our precious water! I graduated from the Herron School of Art & Design in 2013 with a degree in Photography and Art History. Painting is more of an experimental medium for me and is usually heavily influenced by the photographs I take. I recently took a trip to the Indianapolis Museum of Art where I shot some Polaroids of the small koi pond they have in the gardens. It was beautiful, peaceful, quiet. The therapeutic motions of the brush and the quiet meditation that comes with painting is probably my favorite part. Hours can go by before I realize how long I've been sitting and working. I am proud to be a juried member of the Hamilton County Artists' Association (HCAA) and also serve on the HCAA Board as VP of Partnerships. I have solo exhibited as well as had individual pieces in galleries throughout central Indiana. My paintings are also part of private collections throughout the U.S. and Canada. My works range from tiny to large panel dimensions and I offer commissioned work to everyone from individual collectors up to large corporations. A mostly self-taught abstract artist, I currently create from my home studio in Noblesville, Indiana. I especially love working with acrylic mediums, although I also dabble with alcohol inks, oil pastels, and watercolors. I use experimental and traditional techniques to create unique artwork sure to invoke imagination and conversation. Attracted to bold colors, varying textures, and unusual perspectives, all my inspiration is drawn from the beautiful natural world that surrounds us. John Lennon wrote: "Life is what happens to you while you are busy making other plans. " The truth of this quote resounds in everyday life and is why I love creating the kind of art that I make! It enables me to throw away the notion of control and destination, freeing me to allow the process determine the outcome, not the other way around. My hopes are that my paintings reflect this spirit and take viewers on a journey, away from everyday life. I wanted to create a fun, bold, abstract piece, combining the theme of water conservation and, what most people associate the end of summer with, the Midway! The background of rain drops (very apropos for this wet summer) is matched with a triadic color scheme of spheres which represent balls used in the popular carnival "Tubs of Fun" game. The completed project is meant to be visually stimulating and make people feel happy and nostalgic! I loved the challenge! I've never painted on a non-flat surface of this size before. I knew I couldn't use my usual pouring and layering techniques with this canvas, so I had to utilize all my skills, experience, and imagination to make this come together the way it did. As a result, the process took me out of my comfort zone, which is always a path to growth. I spent well over 100 hours doing this project, but I learned that I really enjoyed the detailed work involved. I found it relaxing, almost meditative. I would do it again! Carolyn has a BA with honors in studio art and political science from the University of North Carolina at Chapel Hill. She worked for many years in corporate advertising as a graphic designer/illustrator and later as a communications manager for large national ad campaigns. Last year she completed a large-scale mural project for the rotunda in Carmel High School's library illustrating the entire Dewey Decimal system. 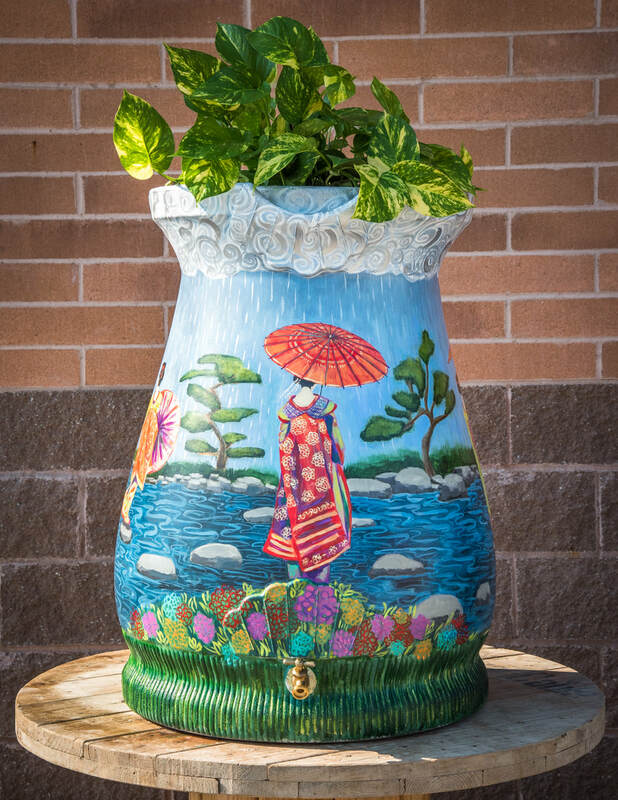 Her work is also installed near the auditorium at Carmel Middle and in the lobby of Cherry Tree Elementary. She was recently awarded the Hoosier Women's Artist award in 2016 and again in 2017 by the Lt. Governor of Indiana and her work will be featured in the Indiana State House until 2018. She has also shown work in many local galleries including ArtSplash Gallery in Carmel and IUPUI's Cultural Arts Gallery in Indianapolis. My inspiration comes from the Kawachinagano Japanese Garden next to Carmel's City Hall, the Japanese Tea Garden in San Fransisco, and rivers and streams I have lived next to in the past. I've always admired how beautifully these special Japanese gardens balance and fuse art and nature together. The imagery I painted has the dancers gracefully balancing on the stepping stones as they carefully make their way across the rising river just as we should gracefully balance our use of water as our supply fluctuates from one rainstorm to the next. 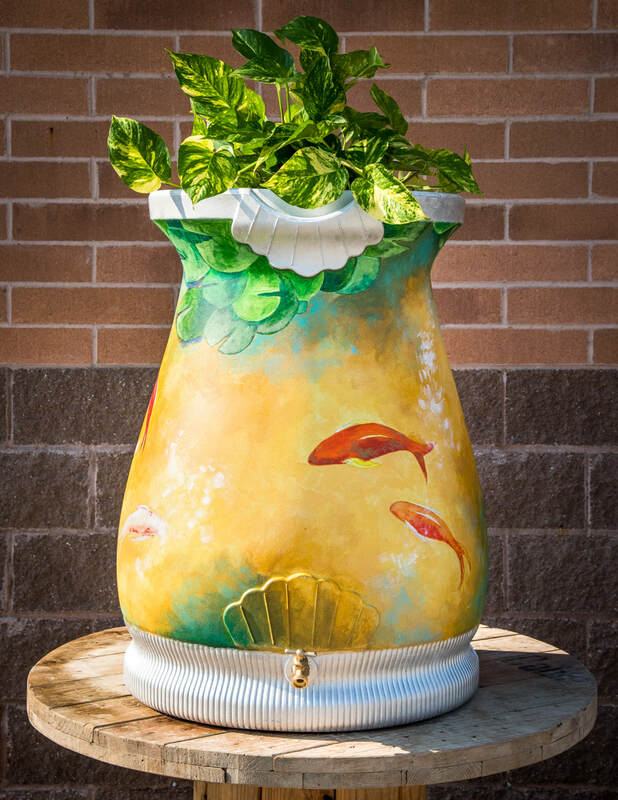 I love that this rain barrel will collect a raw element of nature which can be used to nourish and grow artful gardens, flowers, and food that will sustain and inspire us. It was fun painting on a rounded three-dimensional form instead of a flat canvas. Depending on where you are standing, you can see either one or two dancers at a time which changes the story. I also really liked painting the flowing calligraphic lines to illustrate the fluctuating river and clouds. I have lived in Indiana for more then 20 years and in Carmel for the past 16 years. I have been painting and drawing on and off from childhood. In 2010, I became interested in painting with acrylics and, from that time, have been painting almost everyday. I took several art classes in Indianapolis Art Center and took private lessons from internationally known artists. I have also been using books and online courses to educate myself about abstract painting and using mixed media to create textured paintings. I have developed various unique techniques to incorporate texture into my paintings using organic materials. Since retiring in August 2015 from my full time job as a web developer, I have devoted all of my time to my passion for painting. I am a member of the CCA gallery in Carmel and Nickel Plate gallery in Noblesville. The artists at ReStyled work with Annie Sloan Chalk Paint® to create magic on almost anything you can image. Besides furniture, we paint metal, brick, fabric and leather just to name a few of the endless possibilities. Our goal is to reuse the past and make it new again for our present lifestyles. 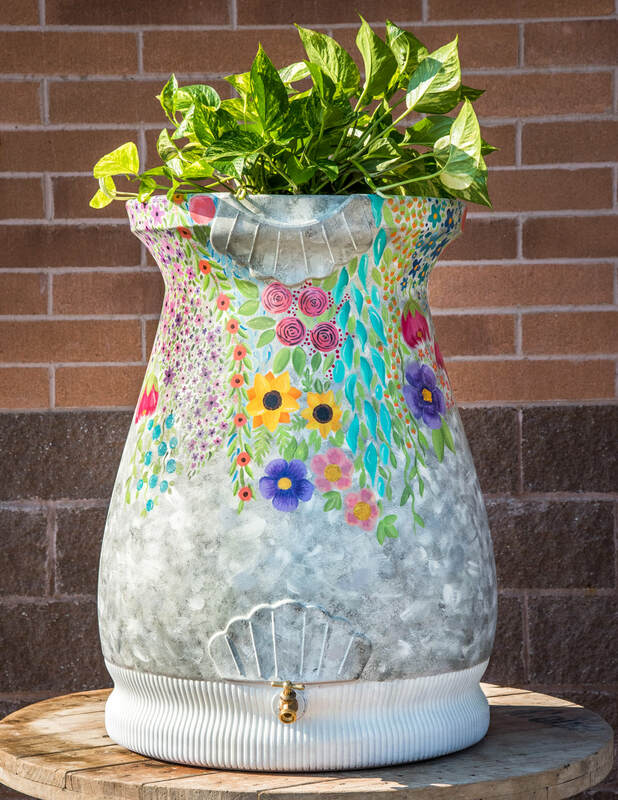 We immediately saw the barrel as the shape of a beautiful vase and knew with our experience with Annie Sloan Chalk Paint® we could create a wonderful Rain Barrel. Inspiration is everywhere and for our barrel we were inspired by the French painting by Jean-Baptiste Greuze, La Cruche Cassee'. It is a wonderful painting of a young girl carrying a broken jug. Our favorite part was working as a team to come up with something extraordinary. We decided on a vase as it is not only unique but a great representation of ReStyled. As a locally, family owned business, ReStyled is constantly creating beautiful and yet functional pieces for the home. Josh has a background working with crayons, pencil, pen, spray paint, and airbrushing. Josh's inspiration was a mossy waterfall, stacked stone, and an old well. I grew up in Brooklyn NY and was part of an artistic family. When I was young, I won a Haney Medal awarded to a ninth or tenth grade student who has shown the most growth and potential in the field of art. It was presented to me at the Metropolitan Museum of Art; that moment kick started my artistic journey. I studied Fine Arts at Indiana University, and spent most of my time at the Henry Radford Hope School of Fine Arts. In my free time I interned at both the Indiana University Art Museum's Administrative Offices and the Mathers Museum, Conservation Lab. I also worked part-time at Echo Press, a fine arts printmaking workshop in Bloomington, IN. I currently enjoy a career in IT as a Program Manager however I nurture my passion for art at home in my private studio where I create pieces inspired by my experiences as well as by nature. My preferred style is expressionism and abstract and will usually be vibrant in color. I love to mix paints, inks and other media with a variety of techniques and tools to create unique images that invoke emotional responses from all who view my art. It brings me great happiness see people touch and experience my work and ask about my journey and inspiration in creating it. 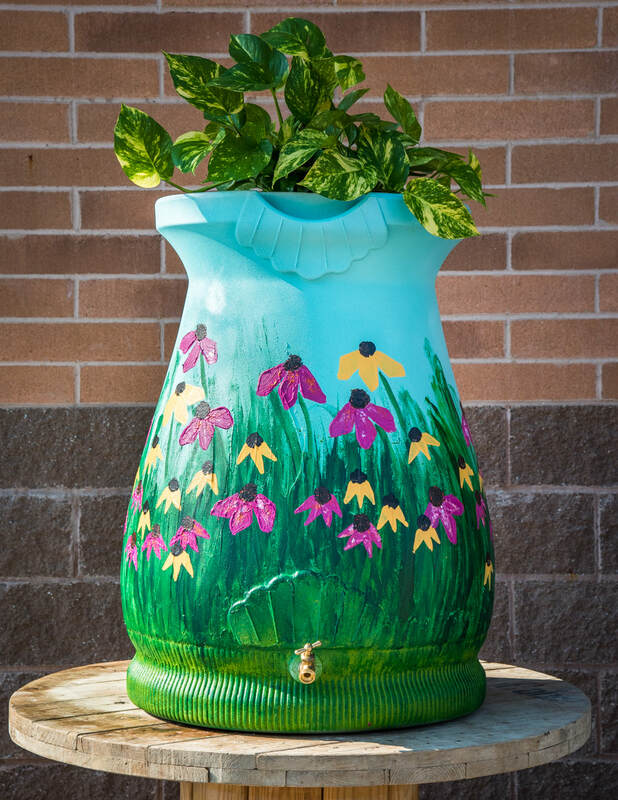 My inspiration for the barrel was nature and the beautiful Echinacea flowers found throughout many of the communities here in Carmel, IN . This barrel is meant to collect water in an outdoor setting. I thought, 'how do I camouflage this large barrel so that it sits comfortably in a natural environment'. I immediately thought to make it part of a floral field where the grass grows tall and the flowers are vibrant. 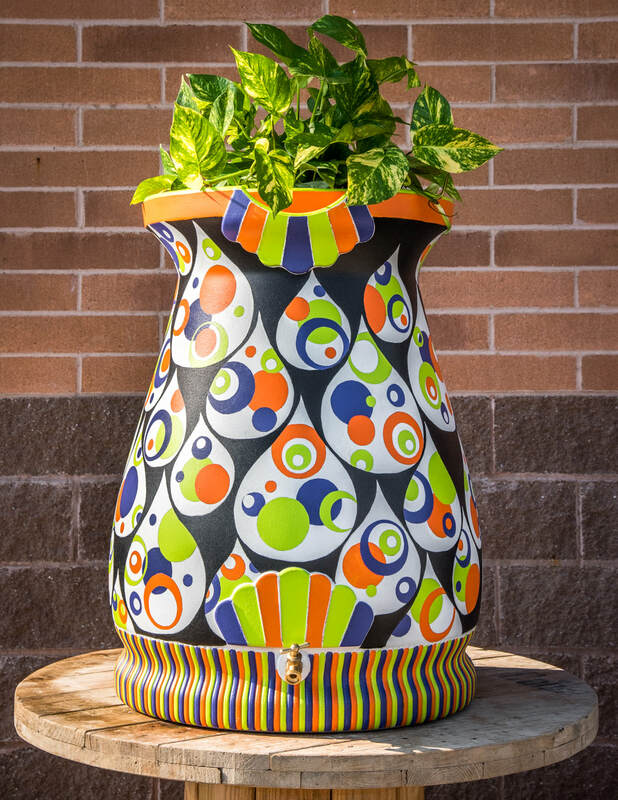 I enjoyed working on the non-traditional surface to create a beautiful and colorful piece that can easily fit into an outdoor setting. When I create images of flowers and outdoor landscapes and it sits on a wall, you look at the image as if it were a window to the outside. It is not a natural setting for the floral/outdoor image it displays. This barrel can actually sit in the actual environment I painted on it and that inspired me through the entire process. I am a fiber & mixed media artist working with individual collectors, residential designers & corporate designers. I have a be studio downtown at the Stutz building where I spend many sunny days and many late nights creating art. I am currently represented by galleries in Chicago, Cincinnati, Hilton Head, Evansville, Ft. Lauderdale, Nashville, TN & Three Oaks, MI. I was inspired by my mixed media series in color & composition. My favorite part was getting the first layer down and seeing it transformed into a colorful form. Being involved in miscellaneous art projects is what I find best suits me, ever since I was 2 years young I've had a passion in illustration. My favorite tea that I had had frequently in my days working in a tea shop called Teavana. Ichigo means "strawberry" in japanese and Paraiso means "paradise" in spanish. This group is the first generation of National Art Honor Society members at Carmel High School. 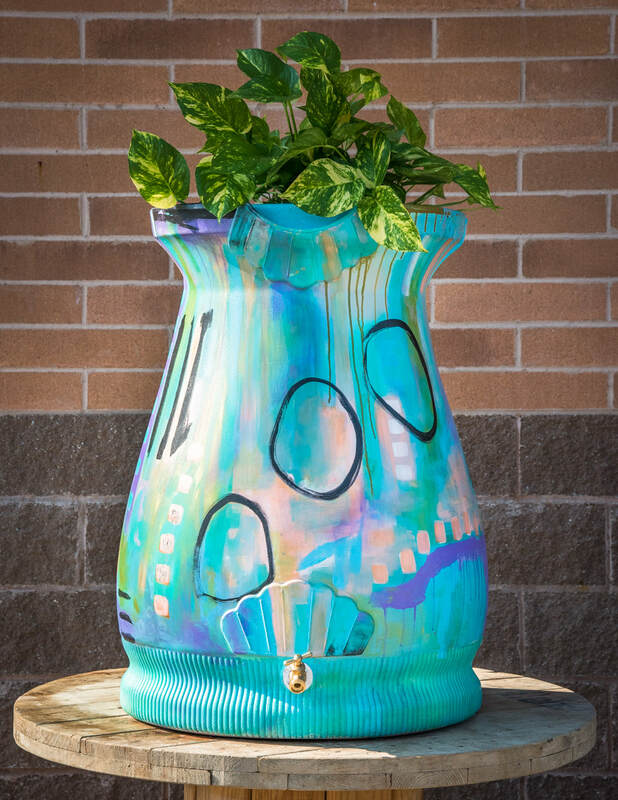 Selected from different art classes around the school, the members all thrive in their own styles and mediums, and are working to spread art around the CHS community. The NAHS members sitting around in a CHS art classroom discussing and brainstorming. Comparing the sketches and seeing all the ideas from the members was a great experience. Siro graduated from UHS this spring as a member of the Class of 2017. She has taken several art classes, including Portfolio Development. She will attend the School of the Art Institute of Chicago next fall. Ezabeth is from Shanghai, China. She completed her AP Studio Art Portfolio in May and graduated from UHS as a member of the Class of 2017. In the fall, Ezabeth will attend Savannah College of Art and Design. The students painted the main body of the barrel yellow. In traditional Chinese color theory, yellow is associated with the earth. It is considered one of the most beautiful colors and also offers good luck. They were also inspired by the symbolism of many different flowers. Flowers are including and are shown growing up out of the earth. These flowers are nourished by the rain drops falling down from above, a reminder of the life that water brings. 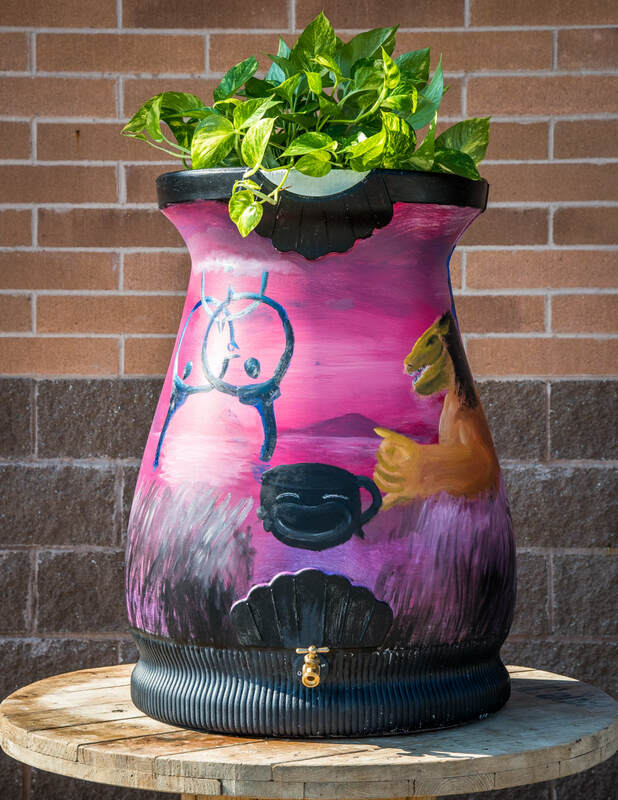 The students painted this rain barrel after finishing their AP Art portfolios and final exams. It was a fun project to finish the year and a great piece to leave the community upon their graduation. I have taken several art classes throughout school, including 3-D, 2-D, ceramics, and IB art. I spend a lot of my free time trying new techniques and mediums. I even have a mural in the works on my bedroom wall. Art is a sort of therapy for me; it is something that brings me a lot of peace and I love to incorporate it into my life whenever possible. I am a very organized and particular person, so I knew my rain barrel was going to be very neat and include exact lines. I love to doodle mandalas and floral designs on a small scale on any paper that I find, so I kind of took all of the designs I had come up with in the past and put them into my barrel. I love the peace that comes with working on any project such as this, so my favorite part was the way working on my barrel allowed me to slow down from my busy life to focus on my artwork.